Zombies vs Cheerleaders « Girls, Guns & Zombies! 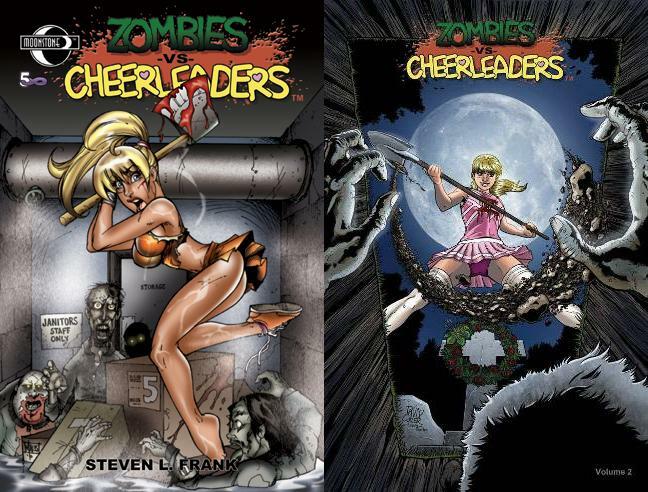 Zombies vs Cheerleaders is a comic anthology series created by Steven L. Frank for Moonstone Books. The series is based on Frank‘s own trading card series from 5Finity Productions. Morbid or funny, and sometimes morbidly funny, top talent bring eclectic tales of Zombies vs Cheerleaders in this best-selling anthology series. 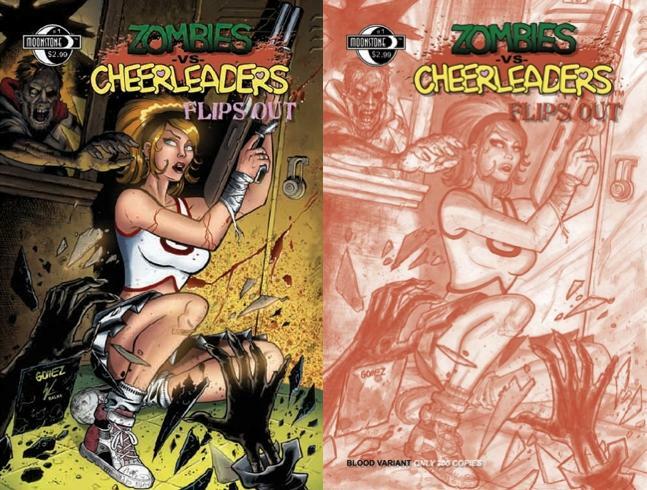 Based on the hit sketch card series from 5FINITY Productions, read the exciting stories of the two things everyone loves: zombies and cheerleaders! Every issue features five variant covers by top pin-up artists and the back cover is always sketch friendly in order to get some hot cheerleaders and ugly zombies sketched by your favorite artists! Girls, guns or zombies? Cheerleaders and zombies! Did you not read the title?! Zombies vs Cheerleaders: Volume 1 (2011). This volume collects ZvsC #1-3 (with all the variant covers), ZvsC: Geektacular #1, and ZvsC Flips Out #1 (a one-shot flip issue with Moonstone’s other zombie comic Rotten). Issue #1 includes “Pep Rallies and Body Tallies, Round 1: Brain Power”, “Pep Rallies and Body Tallies, Round 2: The Score at Half-Time is…”, “Pep Rallies and Body Tallies, Final Round: Oh No He Didn’t!”, and “Pep Rallies and Body Tallies, Bonus Round: Some Girls Have All the Luck”. Written and edited by Steven L. Frank. Art by Ben Glendenning, Jessica Hickman and Frank B. Washington. Cover art by Justin Ridge [A], Jessica Hickman [B], Jason Worthington [C], Andy Black [D], and Mark Bloodworth [E]. Issue #2 includes “Finality” [story by Brandon Jerwa, art by Remy Mokhtar], “Hall-Pass” [story and art by Bill Maus], and “A Piece of Work” [story by Steven L. Frank, art by David Namisato]. Cover art by Daniel Campos [A], Joe Pekar [B], Pasquale Qualano [C], Ben Tan [D], and Mark Slater [E]. Issue #3 includes “Student Bodies” [story by Gerrad McConnell, art by Matt Hebb], “Braindead Youth” [story by Eric M. Esquivel, art by Bill McKay], and “Zombie-ing Camp” [story by Steven L. Frank, art by Shawn Van Briesen]. Cover art by Mike DeBalfo [A, E], Justin Ridge [B], Jason Worthington [C], and Shawn Van Briesen [D]. Geektacular! #1 includes “ZvC featuring The 3 Geeks” [story and art by Rick Koslowski], “Golden Anniversary” [story by Steven L. Frank, art by Jim Kyle], and “Birthday Deathday” [story by Steven L. Frank, art by David Namisato]. Cover art by Rick Koslowski [A], Rich Bonk [B], Jason Metcalf [C], Patrick Finch [D], and Bill McKay [E]. Flips Out #1. “Home Field Advantage”. Story by Steven L. Frank, with art by Remy Mokhtar. Cover art by Joel Gomez, Jason Worthington and Jeff Balke. And, last but not least, a BRAND NEW story! “Role Play”. Written by Steven L. Frank. Art by Jim Kyle. Zombies vs Cheerleaders: Volume 2 (2013). This volume collects ZvsC #4-7 (with all the variant covers), The Misadventures of Becky and Bob #1, and Hack/Slash Meets ZvsC #1. Issue #4 includes “A New You” [story by Steven L. Frank, art by David Namisato], “Pompom, The Dead Killer” [story and art by Dave Baker], “If It Doesn’t Hurt The You’re Probably Doing it Wrong” [story by Eric M. Esquivel, art by Ander Sarabia], and “Alter Ego” . Cover art by James Jaro [A], Dean Yeagle [B], Jeremy Dale [C], Rich Bonk [D], and Daniel Thollin [E]. Issue #5 includes “Batter Up” [story by Gerrad McConnell, art by Matt Hebb], “Lifeguard on Duty” [story by Eric M. Esquivel, art by Ken Wright], and “The Crypt of Dr. Prometheo” [story and art by Dave Baker]. Cover art by Bill McKay [A, E], Pasquale Qualano [B], Ryan Kincaid and Jason Worthington [C], and Ben Hansen [D]. Issue #6 includes “Homecoming of the Dead” [story by Jeff Aden, art by Ben Hansen], “Zombie-a-Go-Go” [story by Heather Finley, art by Bill Maus], and “Catch of the Day” [story by Steven L. Frank, art by Danielle Gransaull]. Cover art by Daniel Campos [A], David Cutler [B], Jason Penderson [C], Elizabeth Torque [D], and Kate Ferguson [E]. Issue #7 includes “Cheerleader v. Zombie!” [story and art by Batton Lash], “In Love With a Cheerleader” [story by Heather Finley, art by Amber Stone], and “The Inarticulate Dead” [story by Eric M. Esquivel, art by David Cutler]. Cover art by George Webber [A], Benjamin Glendenning [B], Ander Sarabia [C], Ryan Kincaid and Jason Worthington [D], and Matt Hebb and Jason Worthington [E]. Becky and Bob #1 includes “Cousin Benjamin” [story by Steven L. Frank, art by David Namisato], “To Protect and Serve” [story by Steven L. Frank, art by Danielle Gransaull], “Super Power Cheer Squad Ultra Force Go” [story by Jeff Aden, art by Jeff Pina and Alfred Trujillo & Bill McKay]. Cover art by Danielle Gransaull. Variant by Justin Ridge. Hack/Slash Meets ZvsC #1. Story by Steven L. Frank. Art by Benjamin Glendenning. Cover art by Tim Seeley [A], Mike DeBalfo [B], Dominic Marco [C], Benjamin Glendenning [D], and Shawn Van Briesen [E]. St. Patty’s Day Special (March 2015). Includes “Zombie vs Cheerleaders vs Lil’ Clovers” [story by Dave Franchini, art by David Namisato], “St. Patrick’s Day Hack Fest” [story by Michele Everaert, art by Ander Sarabia], and “The Peculiar Tale of Jessamine and the Zombie Horde” [story by Heather Finley, art by Bill Maus]. Cover art by DW Miller and Kat Lawday [A], Andrea Errico and Tracy Bailey [B], Pasquale Qualano, Nicole Goff and Kat Lawday [C], and Jason Metcalf and Jeff Balke [D]. 2015 Halloween Special (October 2015). Includes “Pumpkin Ales Are Passé” [story by Steven L. Frank, art by David Namisato], “Field of Zombies” [story by story by Heather Finley, art by Bill Maus], and “Retirements for the Dead” [story by Dave Franchini, art by Manuel Diaz]. Cover art by Mark Bloodworth [A], Bill Maus [B], Jamie Tyndall and Ula Mos [C], and Matt Hebb, Jason Worthington and Tracy Bailey [D]. My thoughts… Flesh-hungry zombies and scantily-clad cheerleaders? Yes, please! Read my original post on MHE (here).